Another long overdue quick and easy recipe that can be whipped up in no time at all. Over the past couple of weeks, I have been rather lucky to have the time off work and was able to relax and chill out, blocking out any thoughts about work and live my life as a man of leisure.....the good life! But all good thing must come to an end, and for me, that was this Monday. Back to the morning rush hour and the evening's long and tedious journey on a crowded train home. It is at times like this that I think dinner must be quick, must not take more the 30 minutes from start to finish. Stir-fried dishes are my fail safe simple cooking that I always turn to whenever I'm faced with a 'can't be bother to cook' situation and why not? It is embedded in my origins. Other than a few chopping and prepping, the cooking itself are easy. All you need if a really hot wok, hot as you dare. Throw in the ingredients in sequence, a few turning and tossing. Bada-bing! Bada-bong! Done! 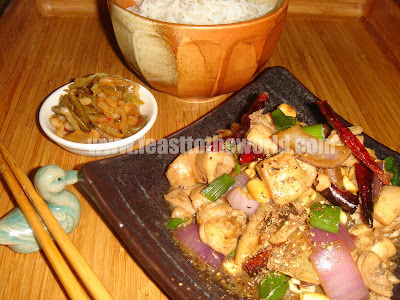 So tonight, I've decided to prepared one of the most popular dishes on a Chinese repertoire....Gong Bao Chicken ( 宫保鸡丁 ). 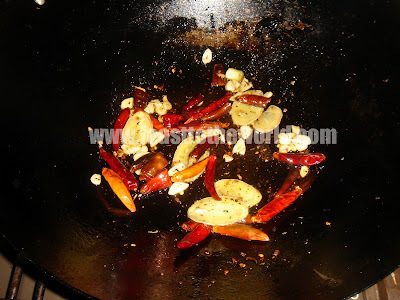 Originated from Szechuan, it is numbingly hot, mostly due to the use of Szechuan peppercorns. It is balanced by the sweet vinegared sauce and the peanuts gave it an added crunchy texture. An excellent dish for a midweek supper. I had mine with a bowlful of steamed rice and a preserved Szechuan radish on the side....Yum! Cut the chicken into small bite-size cubes. Combine in a bowl together with the marinade ingredients and leave for 15-20 minutes. 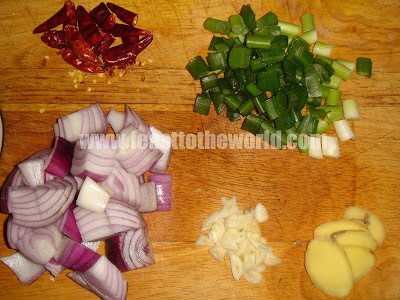 In the meantime, prepared the vegetables so that they are all ready at hand for stir frying. Preapare the sauce by combining all the ingredient in a bowl. Heat up the oil in a wok over high heat, swirling to coat the wok. When smoking, add the ginger and chilies and fry for 30 seconds, until fragrant, then add the Szechuan peppercorns, garlic and red onions and cook, turning and tossing for about 1 minute. 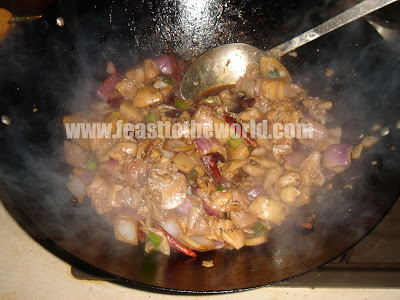 Add the chicken and stir-fry for another minutes before adding in the shoaxing wine around the side of the wok. Continue to cook for another 30 seconds. At this point, give the prepared sauce a stir and pour this into the wok. Continue to stir until the sauce thicken. 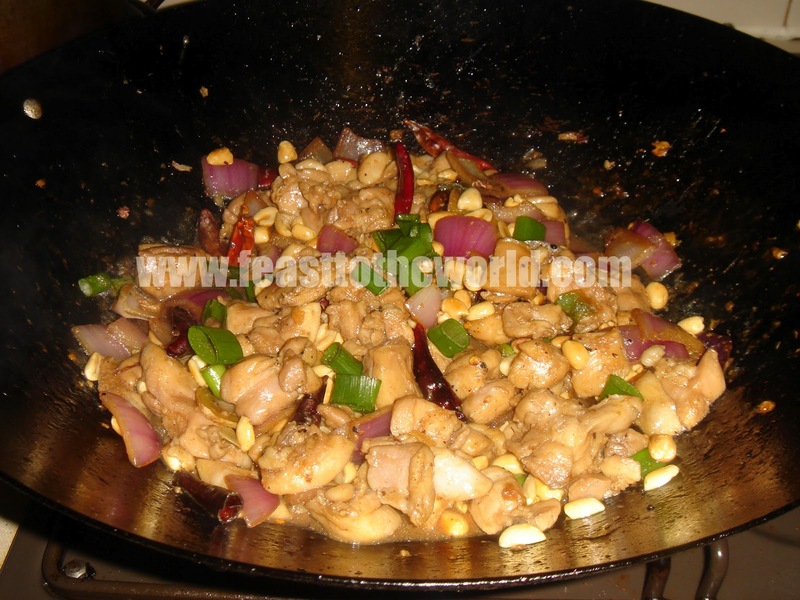 Add in the spring onions, peanuts and sesame oil, stir to mix a couple of times and remove from the heat. Transfer to a warm plate and serve with a bowl of steam rice. I'm really pleased I have stumbled on your blog. I have recently relocated from London to Hong Kong and was trying to find a recipe using chilli, peanuts and chicken...et Voila. Your blog post has it all! Just need to find a proper wok. Thanks for sharing! Thanks you for your kind comment. I'm glad that you liked the blog. Hong Kong is the best place to be if you enjoy food and cooking and a proper wok should be easily acquirable there too. 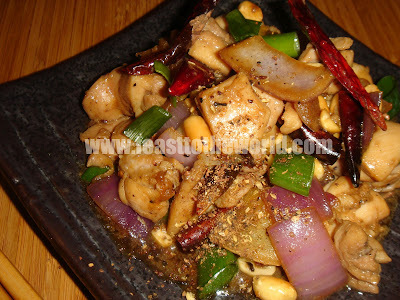 Hope you enjoy the gong bao chicken and do drop by to let me know how it went.